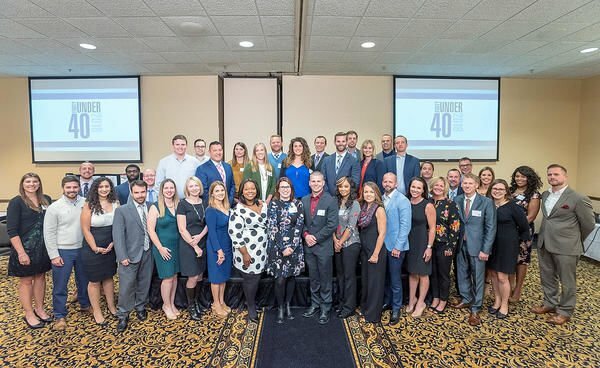 Stephen Haas/The News-Gazette This year's winners pose for a group photo during the Central Illinois Business Magazine's 11th Annual Forty Under 40 luncheon in the Illini Ballroom at the Hilton Garden Inn Thursday, Oct. 11, 2018, in Champaign. Stephen Haas/The News-Gazette Guests visit during the Central Illinois Business Magazine's 11th Annual Forty Under 40 luncheon in the Illini Ballroom at the Hilton Garden Inn Thursday, Oct. 11, 2018, in Champaign. Stephen Haas/The News-Gazette John Reed, CEO of News-Gazette Media and publisher of The News-Gazette, speaks during the Central Illinois Business Magazine's 11th Annual Forty Under 40 luncheon in the Illini Ballroom at the Hilton Garden Inn Thursday, Oct. 11, 2018, in Champaign. 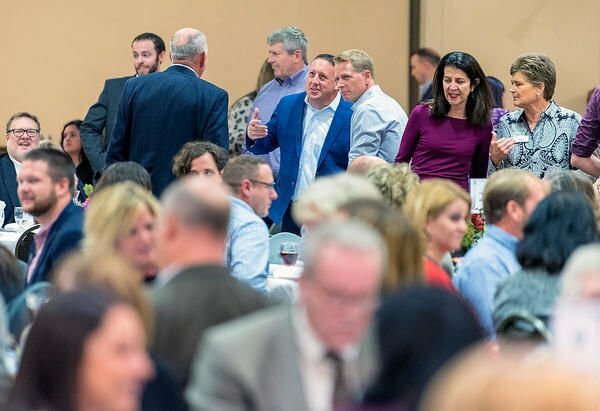 Stephen Haas/The News-Gazette Guests listen to the speakers during the Central Illinois Business Magazine's 11th Annual Forty Under 40 luncheon in the Illini Ballroom at the Hilton Garden Inn Thursday, Oct. 11, 2018, in Champaign. Stephen Haas/The News-Gazette This year's awards are seen on a table during the Central Illinois Business Magazine's 11th Annual Forty Under 40 luncheon in the Illini Ballroom at the Hilton Garden Inn Thursday, Oct. 11, 2018, in Champaign.